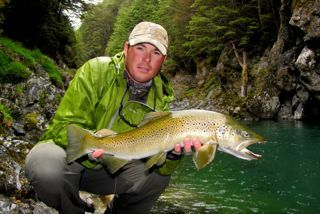 Umpqua Feather Merchants has announced that Josh Graffam, guide and current member of Fly Fishing Team USA, will be joining their team as key account and international accounts manager. LOUISVILLE, CO —Umpqua has announced that Josh Graffam will be joining the company beginning on April 15, 2014. Graffam brings his extensive angling experience to Umpqua where he will take the role of Key Account and International Account Manager. Graffam, a graduate of the University of New Hampshire, began his professional angling career as a Guide at Jack Dennis Sports for six years. He then became Head Guide at The Ranch at Rock Creek, and has spent the past 3 1⁄2 years as the Activities Director of Brush Creek Ranch in Saratoga, Wyoming. Graffam is a current member of Fly Fishing Team USA and is the 2013 National Champion—ranking him number one in the nation among competitive fly anglers. Additionally, Graffam finished 13th in the World Fly Fishing Championship this past year and will be representing the U.S. again in Czech Republic at the end of May. Since being founded in Glide, Oregon by the late Dennis Black in 1972, Umpqua has been an innovator in the fly-­‐fishing industry. In creating the first-­‐ever Royalty Signature Fly Tyer Program, Umpqua altered the course of the industry by making flies more readily available and affordable to anglers everywhere, while at the same time enabling designers to receive recognition and compensation for their creativity. Today, Umpqua has nearly 200 Royalty Signature Designers and has introduced hundreds of revolutionary, game changing fly patterns throughout the years. Umpqua’s innovations extend far beyond just flies, and include award-­‐winning fly boxes, packs and vests; industry unique, ultra-­‐effective tapers; and a comprehensive assortment of high quality streamside accessories, hooks, fly-­‐tying tying materials, tools and more. Umpqua’s headquarters are located in Louisville, Colorado.